This was my first time whipping coconut cream, which I understand can be kind of tricky – from what I’ve read online, there seems to be a lot of brand-to-brand and can-to-can variation in fat content of your coconutty starting materials. I used Trader Joe’s coconut cream, which is supposed to be the most foolproof fat-rich option in stores, but I still had trouble even achieving soft peaks. After things continued to fall flat after several minutes of whipping, I experimented with adding a spoonful of cornstarch to the mix, but I don’t think I recommend it. It didn’t have much impact on the consistency, and it was detectable in the flavor… not terrible, but not ideal. Maybe xanthan gum or arrowroot powder would work better? Let me know if you find out! On to the cake: I’m an unabashed omnivore, but I’m also into baking experiments and figured why not go full vegan to match the coconut topping? But I still needed it to be a real dessert… I didn’t want to settle for a mega-healthful granola-muffin, you know? 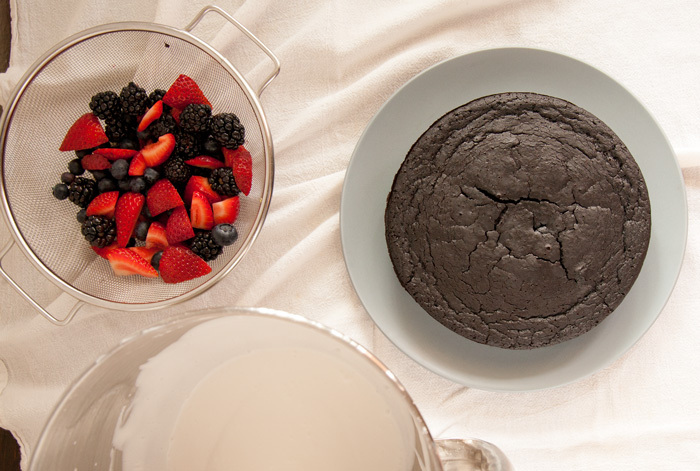 I found the right balance in an adaptation from vegan guru Minimalist Baker, who apparently knows her way around a chocolate cake. I was worried at first, because when I cut the first slice after assembly I was a little dissatisfied with the texture – borderline gummy? But after a little time in the fridge I think it dramatically improved into a super moist fudgy-ness. So it’s perfect for make-ahead convenience! My cake was just for a small gathering, so the single layer was a perfect size. But if you’re planning to supply a big party, this would be SO impressive and delicious doubled and stacked. This could be some serious red white and blue action for your BBQ! Preheat the oven to 350 F. In a large mixing bowl, combine the almond milk and vinegar and allow to sit for several minutes. Meanwhile, oil an 8-inch round pan and dust the surface lightly with cocoa powder. Add the applesauce, coffee, coconut oil and vanilla to the mixing bowl and whisk until frothy. Sift in all remaining ingredients and whisk until just combined. Pour the batter into the prepared cake pan and bake for 25-30 minutes, or until a toothpick inserted into the cake's center comes out clean. Allow the cake to cool completely before topping. If using coconut milk, open the can and scoop the solid coconut cream away from the separated coconut water at the bottom of the can. If using canned coconut cream, this step is unnecessary. Combine the coconut cream and powdered sugar in a large bowl, and whip with a stand mixer or hand mixer until fluffy. 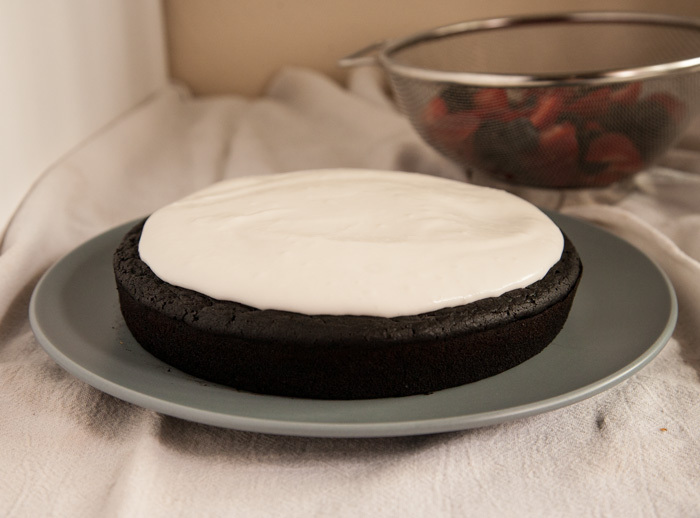 Transfer the cooled cake to a large plate and spread the whipped coconut cream in an even layer. 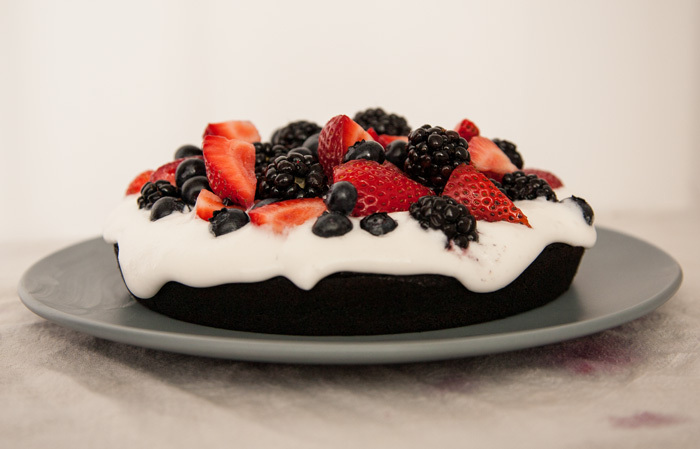 Avoid spreading too close to the edges, because the fruit will displace some of the topping. 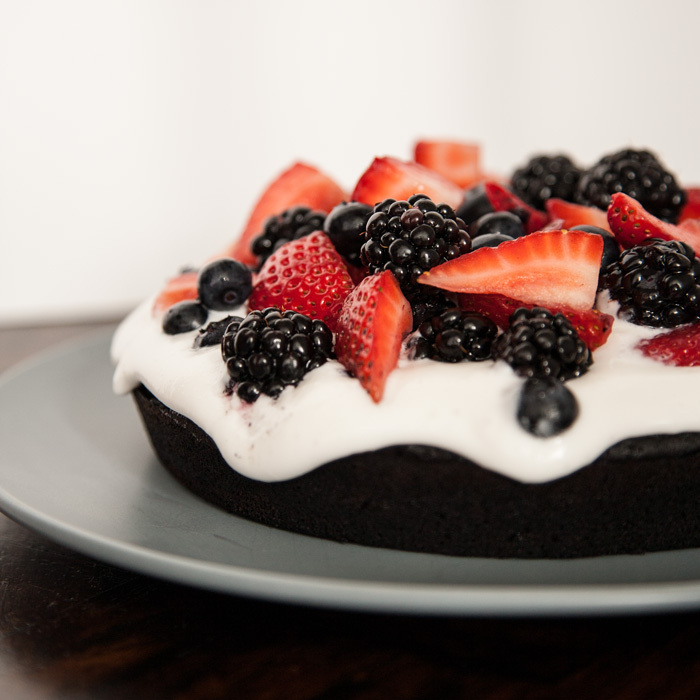 Arrange the berries in an artful mountain on top. The cake can be served immediately, but a few hours of refrigeration help to thicken the cream and firm the cake's texture. That looks scrumptious! Another thought for thickening (although it might be tricky) the vegan/scientist dream –agar-agar? Genius!! It didn’t cross my mind, but I bet it would work really well! This looks so amazing, Mary! I just discovered whipped coconut cream and have been having the same problem getting it to separate even after testing many of the recommended brands. I finally resorted to using our whipper and it’s absolutely foolproof. I did a post about it in http://www.homesweetjones.com/red-white-blue-vegan-chocolate-mousse-parfait/. I add a quarter teaspoon of agar powder for extra stability and get perfect peaks every time. Our whipper was only $40 so if you make this a lot, it’s probably worth the investment. Of course, you don’t need stiff peaks here. 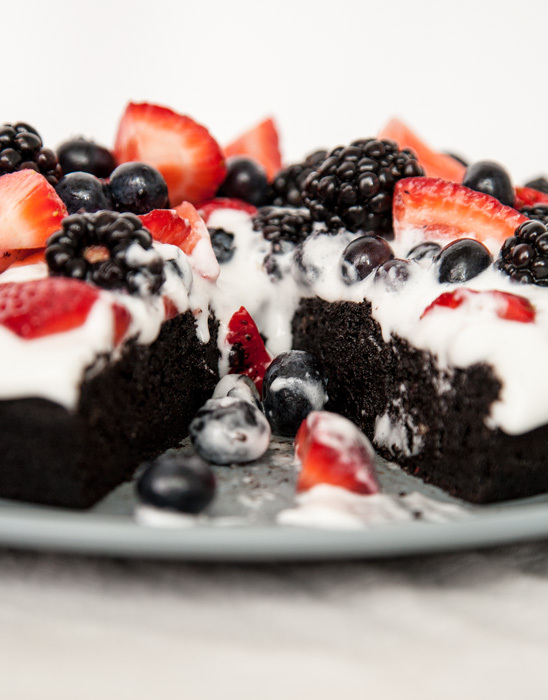 This cake looks just perfect with the oozy foamy deliciousness. Yum! Ahhh, maybe time to try out some power tools? I’ve never tried one of those whippers, but I have some friends who’ve told me how much they love them. I also like the confirmation on the agar agar! Thanks for the tips!! Thanks Dina!! I eat everything as part of a balanced diet, and it helps when a big portion of the dessert is real, wholesome food! this looks too good! definitely could use a couple of slices now.. thanks! Ah, I should have been more clear! I use brewed coffee, the same that you would drink. It helps bring out the deepest dark chocolate flavor. Thanks for noticing this, I’ll change the recipe to clarify.